Rabbits are supposed to be cute and fluffy. They’re supposed to go “hop, hop, hop” through your back yard, searching for some leaves to nibble on. They’re supposed be the protagonist of cute bedtime stories for children. They’re supposed to be cute little cartoon characters who make mischief and munch on carrots. So, why then, is Bonnie from Five Nights at Freddy’s, look like a walking nightmare? Bonnie is an animatronic that really looks like something out of a twisted horror movie. Just don’t let that pleasant purple color fool you. He’s a mechanical scaring machine, designed to put a chill into unsuspecting victims who wander into a Freddy Fazbear’s Pizza location late at night. If your child is looking to creep out his friends, then this Five Nights at Freddy’s costume is just the thing he needs. 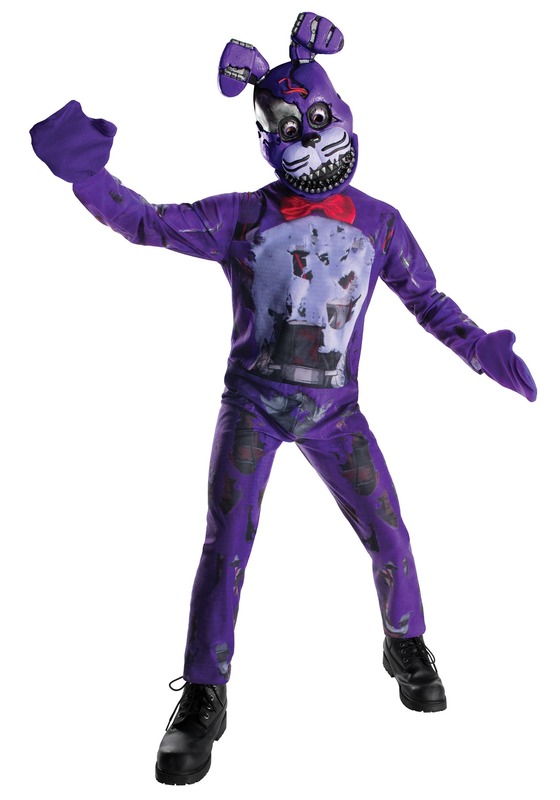 Based on the character from the video game series, this child Nightmare Bonnie costume brings you a truly terrifying look. It comes with a jumpsuit that’s crafted to look like Bonnie’s “Nightmare” especially horrific appearance in Five Nights at Freddy’s 4. It has printed details, like mechanical metallic parts, as well as “rips” and “tears” to further the ragged appearance. A bright red bow rests on the neck and there is a pair of mitts for each hand. The mask is molded to look like Bonnie’s face, complete with wires popping out of the head, bunny ears and even some cold, mechanical looking eyes. To top it all off, the mask has gruesome pointy teeth jutting out of it. It’s certainly not the kind of thing you’d see in a cute, adorable cartoon show!